Open your favorite music program right now, play some music, and turn on the visualizer. Look at it for a minute or two. Put it in the background while you read the rest of this essay. Back yet? Good. Now, what you’ve been looking at is art. I don’t mean to say that it’s Art with a capital “A”, or even that it’s any good–all I mean to say is that you’re looking at some form of creative expression, as distinct from the music you’re listening to as a film is from its soundtrack. 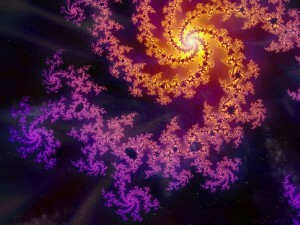 If we agree that fractal art is a legitimate form of creative expression, it’s hard to say your visualizer isn’t. But…what kind of medium is it? It’s a moving image, so it’s certainly not prose or a painting, and it doesn’t seem to be film, because you never see the same thing twice, and what you see is dependent on the music. It’s tempting to call it a game, but I think this is a mistake. It’s not like any game we’ve seen before: it has no objectives or goals, no notion of progress or completion, and very little interactivity. In fact, the little we can do to interact with it–change the music–results in the least interesting behavior. It looks much better if we just let the music play. The program is interacting with the music, not a player–you don’t “play” this game at all, you only watch it! It doesn’t even seem to have rules except in the most abstract sense of the word. You could, I suppose, argue that it still counts as a game, that the music is the “player” and the lines of code that govern the program’s behavior are the “rules”. But doesn’t that seem like cheating a little? If the categorization were that simple, we would still be calling films “photoplays”. Why don’t we? Because calling them photoplays is a disservice to the unique strengths and weaknesses of the medium. Can you imagine what film would be like if we still thought of them as “plays, only on a screen”? The film industry would be a joke! A film that was shot on location instead of on a set would be considered experimental, and a film where the camera moves from place to place instead of remaining static would be the height of avant-garde. No one would have even thought to actually cut and edit the film! The same is happening now with video games: because we call them something they’re not, because we still think of them as “games, only on a computer”, we limit what they are capable of. Look back at your visualizer. What you’re looking at is not a game: it is something new entirely. The fact is, games are not new. Games have been around longer than movies, longer than books, longer than the written word. Kittens play games; they are probably older than language itself. Games are not new. Computers are. Computers have given birth to a medium of expression so unique, so bizarre, so unanticipated, that we can only name it by comparison with what it is not. This medium is not the medium of video games. Those in the video game industry–even those on the very edge of the avant-garde–still hold to the assumption that games are made to be played. But programs don’t have to be played. They don’t have to be interacted with. They don’t have to be “fun”. Like the best true art, they can be beautiful for their own sake. I don’t mean to say that we should stop making games. Computers are a wonderful tool, and–as with dozens of other media including film, painting, photography, and music–they have allowed us to do things with games that weren’t possible before. I don’t even mean to say that games can’t be art, in the highest sense of the word–Brenda Brathwaite’s Train, a game made without a single silicon chip or digital display, is as much a work of Art as any painting or song. What I am saying is that by fixating on games, we are ignoring the potential of this new, unnamed medium. What’s worse, by confusing this new medium with the medium of games, we’re putting severe limits on what we can do with it. Film gave us a new kind of stage play, true–any play, after all, can be translated into a film. So, too, can any game be translated into a video game. But in both cases, the true potential of the medium lies in the things it can do differently than what came before. Games can be wonderful–and like plays, they have strengths that their successor lacks–but these new programs, these notgames, have the potential to be so much more.